I got an email the other day asking about how to set up an arm controller in Nengo, where they had been working from the Spaun code to strip away things until they had just the motor portion left they could play with. I ended up putting together a quick script to get them started and thought I would share it here in case anyone else was interested. It’s kind of fun because it shows off some of the new GUI and node interfacing. Note that you’ll need nengo_gui version .15+ for this to work. In general I recommend getting the dev version installed, as it’s stable and updates are made all the time improving functionality. Nengo 1.4 core was all written in Java, with Jython and Python scripting thrown in on top, and since then a lot of work has gone into the re-write of the entire code base for Nengo 2. 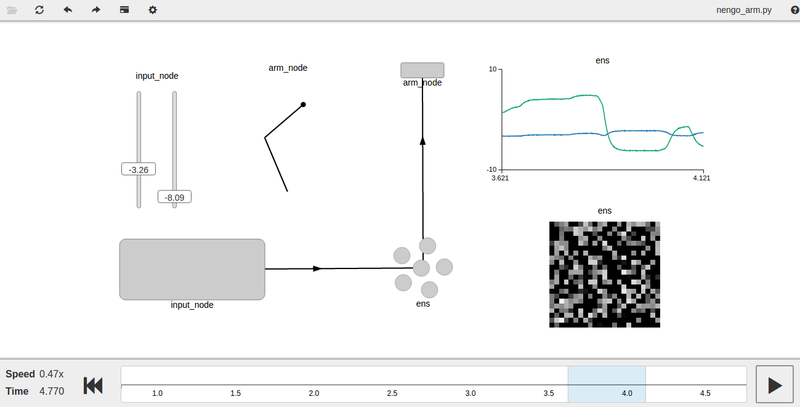 Nengo 2 is now written in Python, all the scripting is in Python, and we have a kickass GUI and support for running neural simulations on CPUs, GPUs, and specialized neuromorphic hardware like SpiNNaKer. I super recommend checking it out if you’re at all interested in neural modelling, we’ve got a bunch of tutorials up and a very active support board to help with any questions or problems. You can find the simulator code for installation here: https://github.com/nengo/nengo and the GUI code here: https://github.com/nengo/nengo_gui, where you can also find installation instructions. And once you have that up and running, to run an arm simulation you can download and run the following code I have up on my GitHub. When you pop it open at the top is a run_in_GUI boolean, which you can use to open the sim up in the GUI, if you set it to False then it will run in the Nengo simulator and once finished will pop up with some basic graphs. Shout out to Terry Stewart for putting together the arm-visualization. It’s a pretty slick little demo of the extensibility of the Nengo GUI, you can see the code for it all in the <code>arm_func</code> in the <code>nengo_arm.py</code> file. Alright. Previously we got our arm all set up to perform operational space control, accepting commands through Python. In this post we’re going to set it up with a set of spiking cameras for eyes, train it to learn the mapping between camera coordinates and end-effector coordinates, and have it track an LED target. What is a spiking camera? Good question! Spiking cameras are awesome, and they come from Dr. Jorg Conradt’s lab. Basically what they do is return you information about movement from the environment. They’re event-driven, instead of clock-driven like most hardware, which means that they have no internal clock that’s dictating when they send information (i.e. they’re asynchronous). They send information out as soon as they receive it. Additionally, they only send out information about the part of the image that has changed. This means that they have super fast response times and their output bandwidth is really low. Dr. Terry Stewart of our lab has written a bunch of code that can be used for interfacing with spiking cameras, which can all be found up on his GitHub. Alright! Easily decoded target location complete. Now that we have a system that can track a target location, we need to transform that position information into end-effector coordinates for the arm to move to. There are a few ways to go about this. One is by very carefully positioning the camera and measuring the distances between the robot’s origin reference frame and working through the trig etc etc. 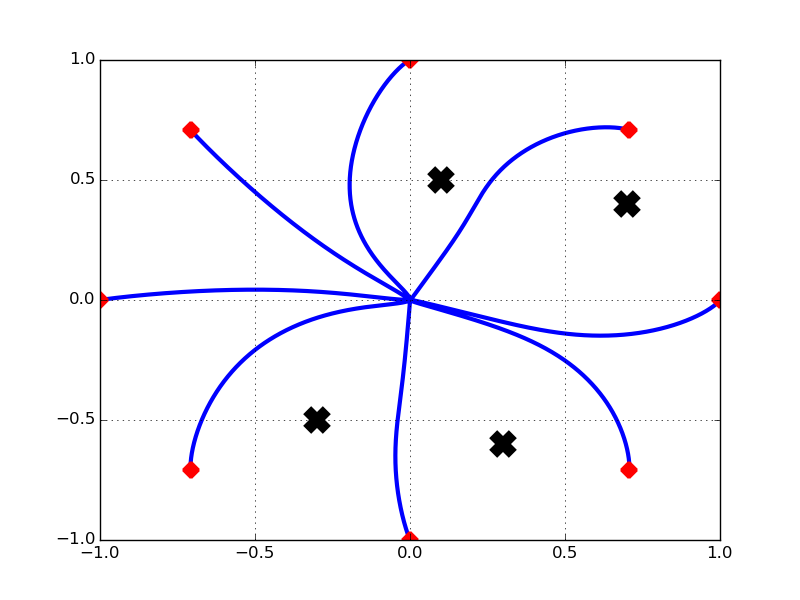 Another, much less pain-in-the-neck way is to instead record some sample points of the robot end-effector at different positions in both end-effector and camera coordinates, and then use a function approximator to generalize over the rest of space. We’ll do the latter, because it’s exactly the kind of thing that neurons are great for. We have some weird function, and we want to learn to approximate it. Populations of neurons are awesome function approximators. Think of all the crazy mappings your brain learns. To perform function approximation with neurons we’re going to use the Neural Engineering Framework (NEF). 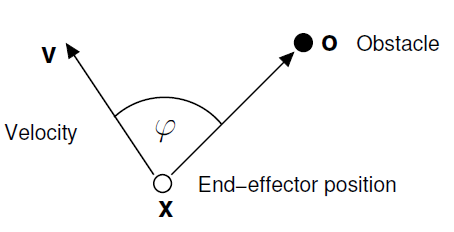 If you’re not familiar with the NEF, the basic idea is to using the response curves of neurons as a big set of basis function to decode some signal in some vector space. So we look at the responses of the neurons in the population as we vary our input signal, and then determine a set of decoders (using least-squares or somesuch) that specify the contribution of each neuron to the different dimensions of the function we want to approximate. use this information to tell the robot where to move. A detail that should be mentioned here is that a single camera only provides 2D output. To get a 3D location we’re going to use two separate cameras. One will provide information, and the other will provide information. This script connects to the cameras, defines some rectangle in end-effector space to sample, and then works through each of the points writing the data to file. The results of this code can be seen in the animation posted in part 2 of this series. OK! So now we have all the information we need to train up our neural population. It’s worth noting that we’re only using 36 sample points to train up our neurons, I did this mostly because I didn’t want to wait around. You can of course use more, though, and the more sample points you have the more accurate your function approximation will be. The neural simulation software (which implements the NEF) that we’re going to be using to generate and train our neural population is called Nengo. It’s free to use for non-commercial use, and I highly recommend checking out the introduction and tutorials if you have any interest in neural modeling. What we need to do now is generate two neural populations, one for each camera, that will receives input from the spiking camera and transform the target’s location information into end-effector coordinates. We will then combine the estimates from the two populations, and send that information out to the robot to tell it where to move. I’ll paste the code in here, and then we’ll step through it below. The first thing we’re doing is defining a function (eyeNet) to create our neural population that takes input from a spiking camera, and decodes out an end-effector location. In here, we read in from the file the information we just recorded about the camera positions that will serve as the input signal to the neurons (eval_points) and the corresponding set of function output (targets). We create a Nengo network, net, and then a couple of nodes for connecting the input (net.input) and projecting the output (net.output). The population of neurons that we’ll use to approximate our function is called net.map_ens. To specify the function we want to approximate using the eval_points and targets arrays, we create a connection from net.map_ens to net.output and use **target_function(eval_points, targets). So this is probably a little weird to parse if you haven’t used Nengo before, but hopefully it’s clear enough that you can get the gist of what’s going on. In the main part of the code, we create another Nengo network. We call this one model because that’s convention for the top-level network in Nengo. We then create two networks using the eyeNet function to hook up to the two cameras. At this point we create a node called eyes, and the role of this node is simply to amalgamate the information from the two cameras from and into . This node is then hooked up to another node called armNode, and all armNode does is call the robot arm’s move_to_xyz function, which we defined in the last post. And there we go! Project complete! We have a controller for a 6DOF arm that uses spiking cameras to train up a neural population and track an LED, that requires almost no set up time. I gave a demo of this at the end of the summer school and there’s no real positioning of the cameras relative to the arm required, just have to tape the cameras up somewhere, run the training script, and go! From here there are a bunch of fun ways to go about extending this. 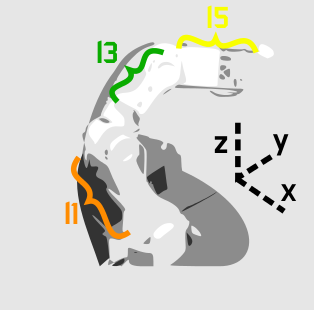 We could add another LED blinking at a different frequency that the arm needs to avoid, using an obstacle avoidance algorithm like the one in this post, add in another dimension of the task involving the gripper, implement a null-space controller to keep the arm near resting joint angles as it tracks the target, and on and on! 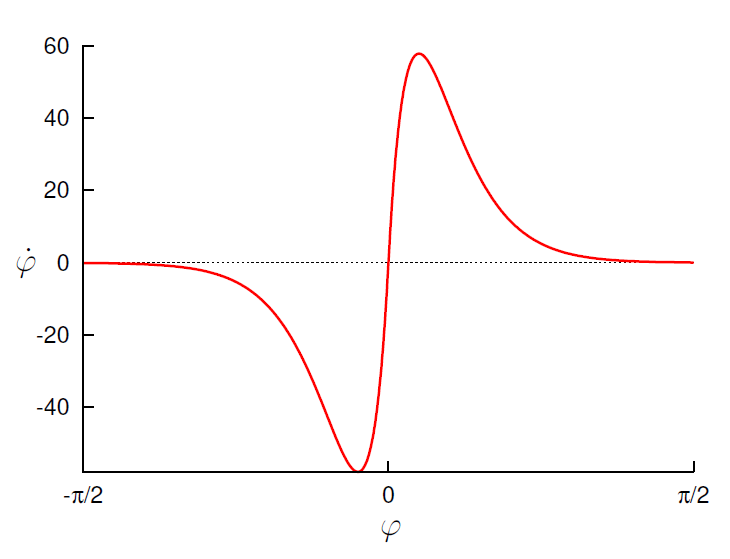 Another thing that I’ve looked at is including learning on the system to fine tune our function approximation online. As is, the controller is able to extrapolate and move the arm to target locations that are outside of the range of space sampled during training, but it’s not super accurate. It would be much better to be constantly refining the estimate using learning. I was able to implement a basic version that works, but getting the learning and the tracking running at the same time turns out to be a bit trickier, so I haven’t had the chance to get it all running yet. Hopefully there will be some more down-time in the near future, however, and be able to finish implementing it. For now, though, we still have a pretty neat target tracker for our robot arm! In the previous exciting post in this series I outlined the project, which is in the title, and we worked through getting access to the arm through Python. The next step was deriving the Jacobian, and that’s what we’re going to be talking about in this post! this is me trying my hand at making things clearer using Inkscape, hopefully it’s worked. 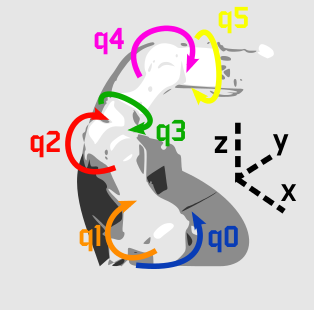 Displayed are the first 6 joints and their angles of rotation, through . The 7th joint, , opens and closes the gripper, so we’re safe to ignore it in deriving our Jacobian. The arm segment lengths and are named based on the nearest joint angles (makes easier reading in the Jacobian derivation). So now we are able to convert a position in 3D space from to the reference frame of joint back to our origin frame of reference. Let’s keep going. Alright! Now that we have all of the transformation matrices, we can put them together to get the transformation from end-effector coordinates to our reference frame coordinates! At this point I went and tested this with some sample points to make sure that everything seemed to be being transformed properly, but we won’t go through that here. Alright! Now we have our Jacobian! Really the only time consuming part here was calculating our end-effector to origin transformation matrix, generating the Jacobian was super easy using SymPy once we had that. To approximate the control then we’re simply going to take the current set of joint angles (which we know because it’s whatever angles we last told the system to move to) and add a scaled down version of to approximate applying torque that affects acceleration and then velocity. where is the gain term, I used .001 here because it was nice and slow, so no crazy commands that could break the servos would be sent out before I could react and hit the cancel button. What we want to do then to implement operational space control here then is find the current position of the end-effector, calculate the difference between it and the target end-effector position, use that to generate the end-effector control signal , get the Jacobian for the current state of the arm using the function above, find the set of joint torques to apply, approximate this control by generating a set of target joint angles to move to, and then repeat this whole loop until we’re within some threshold of the target position. Whew. And that is it! We have successfully hacked together a system that can perform operational space control of a 6DOF robot arm. Here is a very choppy video of it moving around to some target points in a grid on a cube. So, granted I had to drop a lot of frames from the video to bring it’s size down to something close to reasonable, but still you can see that it moves to target locations super fast! Alright this is sweet, but we’re not done yet. We don’t want to have to tell the arm where to move ourselves. Instead we’d like the robot to perform target tracking for some target LED we’re moving around, because that’s way more fun and interactive. To do this, we’re going to use spiking cameras! So stay tuned, we’ll talk about what the hell spiking cameras are and how to use them for a super quick-to-setup and foolproof target tracking system in the next exciting post!